Join Tommy Lasorda and Maria's Italian Kitchen in a Night of Wine & Great Food. Maria's Italian Kitchen invites you and your colleagues, friends & family to try award winning cuisine and wines of Italy; featuring the Italian wines of legendary Hall of Famer Tommy Lasorda. Throughout the evening sample the complete Line -up of Lasorda Italian Wines & enjoy Maria's old world charm and wonderful Italian classics in the company of one of baseball's most famous personalities. Doors open at 5:00pm; $20 payment taken at the door. Self Park: 616 Figueroa St. Entrance will be at 615 S. Flower St. Entrance fee ($20) at the door includes wine tasting, passed appetizers, entertainment & 2 raffle tickets per person. 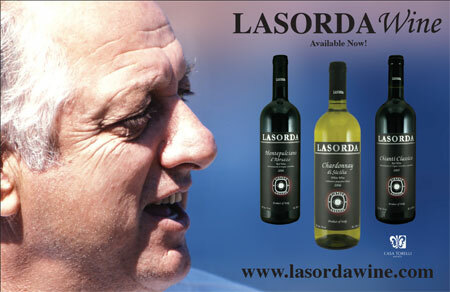 Autographs will be available for Lasorda Italian wines only. Minimum purchase is required. No baseball memorabilia permitted for autographs. Must be 21 and up to enter.